National Lampoon had a hit on their hands with Animal House and it would take four years before they brought another film to the big screen with Class Reunion, a film largely reviled by critics and ignored by movie goers. This isn’t a good movie, but for those of us that caught it at the right point in our lives, it’s an absolute treasure. It’s a slasher/horror comedy that isn’t at all horrific-it doesn’t really try to be- but it does manage to be stupidly funny in some of silliest ways. I love it. It’s been about a week since I spun it for this review and I am already looking forward to watching it again! In 1972, a group of kids from Lizzie Borden High School pulls a mean, despicable prank on Walter Baylor, a fellow classmate. Ten years later, almost the entire class comes together for their reunion, held at their old high school grounds, now disused and largely rundown. What they don’t know is that their malicious prank sent Baylor to a mental institution. He’s escaped and, one by one, wants to make the class pay for their actions. National Lampoon’s Class Reunion is inarguably a low-rent movie, some would even say poor, and I love it wholeheartedly. I fully acknowledge that my love of this film is rooted in nostalgia. Along with a handful of other movies, some classics, some deeply questionable, I discovered Class Reunion at our local video shop, called “Video to Go”, Hedge End, a village in the south of England. As I was already obsessed with movies at such a young, impressionable age, and enthusiastic about all kinds of movies, I absorbed all the bizarre, broad-stroke and dark comedy offered throughout this film like a squirrel with an acorn. This film is at least notable for two things, the first, being written by John Hughes, earning him his first screenwriting credit before he would go on to deliver wonderful teenage-experience movies like Pretty in Pink and Ferris Bueller’s Day Off. The second is that, despite the credit, Hughes claims he was fired from the production and his script so butchered, it doesn’t at all resemble his intentions. Despite that, it’s hard not to find Class Action a wonderful oddity. Even when, and perhaps because of, the comedy doesn’t land quite right. Every moment and performance is pushed to 11, delivering a pantomime-like quality. The over-the-top nature has driven a good deal of the film’s chorus of critics, but again, I have always found it entertaining when that pantomime quality is embraced. The cheap-ish sets and slap-dash plotting give the good cast nowhere else to go but bigger, and several of the characters become memorable as a result. Gerrit Graham’s smarmy, cowardly high-school prom king, Bob Spinnaker, is so likeably unlikable, with his silver-spoon stylings and low-brow aristocracy that, as secondary ‘villains’ go, it’s fun to watch his modest character arc come into focus. Stephen Furst’s Hubert Downs, a used-car salesman-like schlub, persistently horny and a walking case of sexual harassment delivers some of the easiest, cheapest laughs. Miriam Flynn’s Bunny Packard provides the prissy, uptight snobbery-type, and her scenes with Satan loving Delores Salk (played memorably by Zane Buzby) are among the best. The remaining cast all manage to make their mark. Mews Small’s Iris Augen, a frisky, klutzy blind women is used to get some cheap laughs at the expense of the blind, but there’s a real creativity and empowered energy in this character it becomes hard to write off as just poor taste. Shelley Smith’s Meredith Modess, class beauty and the elegant one of the bunch, isn’t really played for laughs but is instrumental in the romantic subplot, such that it is. Blackie Dammett gets the chance to play the betrayed and crazed killer, with an effective unhinged and imbalanced deliverance, while the hero of the film, Gary Nash, comes with all the underdog charms actor Fred McCarren can muster for a man none of the class can even remember having known. The rest of the cast of characters includes Jim Staahl as Egon Von Stoker, a bizarre, Dracula type, two stoners, Chip and Carl, played by Barry Diamond and Art Evans (who get a nice moment or two), the unforgettable Anne Ramsey as the gross dinner lady, Mrs. Tabazooski, and Michael Lerner as Dr. Young channeling Donald Pleasance’s Loomis from Halloween. Bizarrely and entertainingly, Chuck Berry makes a fun appearance, too. National Lampoon’s Class Reunion will never be mistaken for a good film. It won’t be heralded as a misunderstood cult classic, but what it is, at least for this reviewer, is a film that holds up considerably better than many other films that made me giggle as a pre-teen, and for whom revisiting was a delightful walk down memory lane. 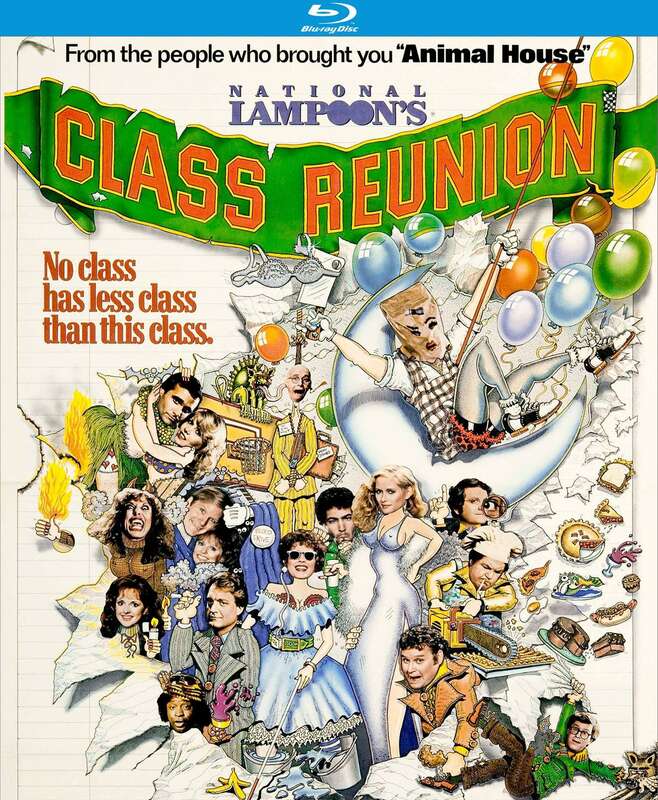 Class Reunion is the kind of film that you’d be forgiven for thinking would never make an appearance in High Definition, but thanks to Kino Lorber, it has not only made its way to the shiny Blu-ray disc format, but it looks far better than anyone could have imagined courtesy of a 4K scan of the original negative. Retaining the film’s theatrical aspect ratio of 1.851, what is most striking is the level of fine detail, with surprising detail on fabric and faces. Details on the sets, dilapidated hallways and run down rooms are well showcased here. Color is pleasingly strong and consistent, with the red of the high school jackets popping delightfully during the opening campfire sequence. Kino Lorber provides this forgotten and oddball gem with an effective English 2.0 DTS-HD. The volume level is a hair quieter than standard, but we find a rather a good representation of Chuck Berry’s musical number. Dialogue is clear and the dramatic underscore serves the feature well. This isn’t a standout audio, but I can’t imagine it ever was. This disc comes with a light package of special features including an enjoyable, almost 13–minute interview with Gerrit Graham, who speaks fondly of the filmmaking process and sense of freedom and improvisation allowed, and he offers some fun tidbits about the cast and process. The second major special feature is the interview-style audio commentary featuring director Michael Miller and stunt coordinator Dean Raphael Ferrandini. You get the impression that Miller wasn’t a fan of John Hughes (he praises his comedy, but calls him a snake in the same breath). Changes to, and influences on the script are discussed, as are the qualities and strengths of the cast of actors who made their mark in the film. The commentary can be a little awkward at times but remains a very interesting through the end. If you have seen National Lampoon’s Class Reunion before, revisiting the odd curiosity that this comedy is will be worthwhile. If you’ve never checked it out, I can say it’s worth watching so long as you know exactly what you’re getting; A scattershot, messy parody with zero nuance or subtlety, but just enough potential and atmosphere to make its faults become more than a little but charming. Kino Lorber continues to present films that you might have never believed would ever make it to the Blu-ray format. For me personally, they’ve release two of my most treasured 80s films I would have bet good money would never have seen the HD light of day, Class Reunion and Real Men. For that, Kino Lorber will forever be my hero. Gerrit Graham… no other reason needed to upgrade from dvd. but my fav character is the goofy blind woman. Previous Previous post: Karloff-Lugosi Collection from Shout?